There are times when being a father is the most glorious things in life, but then there are those other times when one feels so inadequate for the job, wondering if what he’s doing is really good enough. Sometimes it’s downright challenging and discouraging. But this time, what started out as a discouraging time ended with a blessing sent straight from Heaven. Mark and I were getting ready to go out of town, and Mark wasn’t too happy with me at the moment. You see, Mark had seen this saddle in Hattie’s store that he wanted, and he had her place it on order for Mark last winter. Now a saddle is a pretty expensive item, and I wasn’t included in this deal. So when I firmly told Mark he couldn’t have the saddle I was suddenly the bad guy! Mark turned around. “It’s already made,” he said in a sorrowful voice. I stopped, fed up with his attitude. He had been this way for the last two days and I didn’t see any reason for it. My voice held warning. He was getting close to my tolerance level! “You wouldn’t understand,” he answered as he suddenly poured the water out – right over his mother’s marigolds. Now, that made me mad! I yelled at him for that. "Mark! Look what you've done to your mother's flowers," I scolded. "Just hurrying,” he tried to defend his reason. “Besides they’re not hers any how. You planted them.” There was a lonesome tone in his voice, a tone I didn’t understand. It made me sad to hear him talk this way. "I did, but you remember she liked marigolds along the porch." "What's the sense of remembering somebody that's left ya'?" Mark asked. It hurt me to see Mark so indifferent about his mother’s being gone. Something was wrong and I didn’t know how to reach him. That frustrated me. "Now hold on son. Your mother didn't leave you. She died God rest her. You’re not letting yourself forget that are you?" That made me angry. I love my wife very much and couldn’t stand the attitude this boy was having! I hurried into the house and got my wife’s picture. I came back out and practically shoved it right under his nose. "Here, the year she died, you were six. How can you forget?" I suddenly wanted to understand what was going through his head. I’d never heard such things come from his mouth and it was hard for me to know how to reach him this time. "It's just a picture. I told you, you wouldn't understand,” Mark blurted out at me. “Forgetting the mother you’ve talked about and loved all your life? No, I can’t understand that at all!” I answered. I felt so horrible at the moment. I didn’t know how to reach him, and for a parent, that can be a terrible feeling! All I knew was that I was very hurt and angry with him. “You know I can’t leave you here alone!” I answered him angrily. "Well I sure wish I didn't have to go!" he shouted in that childish pout. "The way your acting, so do I,” I answered honestly and defeatingly. Mark’s attitude hadn’t gotten any better when we got to the crossing where I was to meet Andrews. I decided we’d camp out by the Wagon Train tonight. “Pa, Why don’t I just turn around and go home?” he suddenly asked. Oh boy, this boy was really trying my patience! I stayed calmed, preoccupied with more important things then rewarding a twelve year old with an attitude with my attention – kind or unkind. He had asked a ridiculous question, and the answer was obvious. “Because it’s too far for you to ride by yourself and I’m not rich enough to miss delivery on an already paid for $200 seed bull.” I answered his question without looking at him. We ate supper before I went looking for Andrews with the bull. Before I left, I gave Mark an order. “You stay close here. Some of these pioneers aren’t exactly westbound pilgrim fathers.” I heard the woman singing and didn’t like the words she was singing or the way she was singing them, so I added, “or mothers.” I picked up my rifle to leave, but I didn’t even get an acknowledgment for my order. “Do you hear me?” I raised my voice at Mark for what seemed the hundredth time that day. “Yeah,” Mark answered shortly, but I wasn’t so sure he did. I gave him a frustrated look, then left. Lonely nights can be so long. Mark touched his hat to her, then made his way up to her as the men stood and watched. Mark told her his name, then she asked him if he liked her singing. “I sure do,” Mark gave her a big, pleasant smile. “And what do you think of me?” Hazel asked as she touched Mark’s arm. Mark looked around. “Well ma’am, I think you’re real pretty,” he answered honestly. The men began gawking and making fun of him. That made Hazel mad, and she quickly silenced them. She turned back to Mark and asked him if he had eaten. “Well not since supper,” Mark answered with another smile for the pretty lady. “Catch hold,” she held out her hand to him and pulled him up to sit beside her on the wagon. She gave him a cheese sandwich and a blackberry jelly sandwich. “Mark!” I called from the edge of the crowd. “Get down out of there!” I ordered harshly. I was unhappy to see him in such company with a half-dressed woman who was spending her evening flirting with men, rather unmarried or married! I was angry, also, that Mark had deliberately disobeyed me. He started back-talking me. “But Pa, she’s singing!” he argued. I walked up to him and stood right in front of him. “Come on, Mark. This is no place for you,” I ordered again, only this time my voice held a warning in it. And then this woman decided to cut in and complain about the way I was choosing to discipline my son. "Don't be such a bear pop! I didn't harm the boy." "Well, that's not the point," I stated. She knew what my problem was. "He's a sweet friendly boy.” She stood up and stood only an inch from me. In a seductive voice, she said, “I wish I could say the same thing for his Daddy." The men laughed. My mood wasn’t getting any better. “Mark,” I said in a quieter voice, trying to control my temper. “Sorry, pop.” She smiled. She knew who had won Mark’s affections. She just smiled at me. That was it! I’d had it with her and with Mark! I grabbed Mark by the arm and dragged him out of there. I dragged him all the way back to camp and gave him a big tongue lashing, but he wasn’t listening to me. What was going on with my boy? Why couldn’t I reach him? It made me angry to see him behave in such a defiant manner, and it made me angry knowing that I couldn’t reach him this time. I was searching for an answer. That’s why I reacted so angrily. “Don’t ever let me catch you in that kind of company again, Mark!” I demanded sternly. I didn’t like him hanging around that kind of company – no matter how old he was! "Pa, she was nice to me," he answered. I threw down the stick I had and hurried over to him. I roughly grabbed him by the arm and turned him to face me. Angrily, I yelled, "I don’t care how nice she was. I told you to stay here." I never could tolerate flat out disobedience! Mark was a little surprised at how I was acting. He was going through some sort of inner struggle and I was loosing my patience. "What's the matter with you Pa."
"I'm sorry, I guess it was me I was hollering at,” I stated as I calmed my voice down. I decided that dropping the subject for now was the best thing to do. We both needed to cool off. I told him it was time to turn in. "If you wake up thirsty, hold off until we leave camp. No tellin' if that water over there in that barrel is safe to drink or not. It could be polluted,” I told Mark. I got no response. “Ya' hear?" I could tell by my voice that I was still angry at him…and at me. It wasn’t long after I went to sleep when Mark did get up. He went to the canteen and found it empty. Then, almost out of defiance, he went to the barrel to make sure I was asleep. He took a drink of the water, but it didn’t taste good and he spit it out. Two weeks passed. Mark’s attitude seemed to improve over that time. I still remember the day it happened – the day my whole world crashed and there was only one thing that mattered in my world. I no longer fretted over Mark’s disobeying me. That was trivial compared to what I was facing now. For me, it was the worst fear of my life, and it was something that was completely out of my hands. Nils had stopped by the ranch to look at our new bull. I invited him and Pedro to stay for supper. Because I was busy with company, I didn’t notice that Mark wasn’t feeling well. While we were out in the yard, Mark had fallen to the ground and dumped the water out but I never noticed. Later when he was getting cleaned up he felt faint, but for some reason Mark didn’t tell me. While we were eating, Nils and I were making conversation, and I hadn’t even noticed that Mark’s eating habits weren’t like they normally were. He had hardly touched his supper and he was being quiet. But then Nils put some more food on his plate to encourage him to eat. Mark stood up suddenly, refusing to eat the food offered to him. I was immediately concerned about his manners and lightly scolded him for refusing a guest. But then I took a closer look at him. Something was wrong – very wrong! I suddenly touched him. He was very warm – hot actually. I worriedly asked him if he’d been outside with his shirt off. Mark was gasping and suddenly acting very strange. I touched him in different places on his chest. “I can feel the heat pouring right through you, boy.” I was suddenly very worried. “My head hurts, Pa,” Mark cried suddenly. I knew he was sick. “The place for you is in bed,” I declared as I picked him up into my arms and carried him into the bedroom. He began gasping as I took his boots off. I immediately laid him down and tucked the covers up and around him. He was gasping and shaking as I put his night shirt on him. “Nels!” I desperately reached for someone else because I didn’t know what to do. Nils place his hand on Mark’s forehead. Mark was becoming delirious. He started talking about a canyon. I looked at Nils. “Mark, listen to me son!” I exclaimed. “No, we need to fence it in. Someone could fall!” he suddenly gasped. He was out of his head. Nils walked away. I was terribly worried. So was Nils. “The fever, it could scorch your hand, it must be 105!” Nils exclaimed. Fear gripped me as I watched my son gasp from delirium. What was going on? What was wrong with my boy? Nils said this was something for a medical doctor, not him. I told Nils to do what he could. Nils just stared at me. “Well you know that Doc Burrage is back East!” I reminded him. I was desperate – fear gripped my very being. "This won't help your boy any," he stated calmly. He knew I was doing it out of pure desperation. I had absolutely no idea what to do at this point! He suggested I send for Dr. Hennekin. “Hennekin?” I didn’t know the name. Nils stated that he was the best medical man in the territory. He was from Canada and pretty old. Nils warned me that he may not feel like coming. I felt a ray of hope, and I knew that I would move heaven and earth to get this doctor to my house. I started to leave, stating that he would feel up to it alright. But suddenly, Mark called out to me. "Pa, I'm cold." “I’ll make it worth your while!” I assured him. My heart sunk as the fear inside me grew. I hurried into my son and sat down at his bedside. “What is it, son?” I asked gently. “A big white runaway horse knocked you in the canyon, Pa. Better keep your rifle handy, Pa!” I didn’t know what to say, so I assured him I had it right with me. Suddenly, Mark cried out in pain. “My insides…they hurt something awful, Pa." Pain filled me as I looked down at my boy in so much pain. I was at a loss as I just kept my hands on him and watched him suffer. Hattie arrived the next day after hearing about Mark. She was there to help me through one of the worst ordeals of my life. Micah came by that afternoon to find out how Mark was doing. “In the morning a little better, in the evening…much worse,” Hattie answered sadly. I couldn’t leave his bedside for a second. I just sat there and watched him suffer. He had finally seemed to calm down. At least he was quiet now. I asked Hattie if that was a good sign. “I wish I knew, Lucas,” she simply answered. But suddenly, he was screaming again. “Shoot him Pa! Shoot him!” He screamed loudly. I simply tucked the blankets around him tighter and listened to him scream. Suddenly, Pedro was yelling that he had returned with the doctor. I rushed out of the room and outside. I was no longer helpless. Now I could get some answers and find out just what I was up against. He didn’t answer me but turned to Hattie. "Do you know anything about nursing?" "No, but I'm a woman," she answered in a broken, yet determined voice. She then took him in to Mark. I took a few moments to compose my emotions before following them inside. I cannot even describe the emotions I was feeling at that moment – it was total hopelessness. I wished I didn’t know how deadly typhoid fever was. Maybe then I wouldn’t have been so terribly frightened. I waited silently as he examined Mark. “I need ice. Tubs of it, day and night,” he announced. The doc said we’d try wet compresses. Mark cried out in pain again. Dr. Hennekin introduced himself to Mark. He had a vision: Dr. Hennekin was at the top of a huge canyon, and Mark was at the bottom. There was a rope there. The doctor was telling Mark to reach for the rope. But Mark just sat there on the green grass, surrounded by his mother’s flowers. He stood half way up then to reach for the rope. Suddenly, a woman all dressed in white with her head covered said, “You’re not really trying, Mark.” Mark turned and stared. She was walking by a pool of water. He was immediately mesmerized by her. “Who are you?” he moaned to himself. While he was dreaming, the doctor, Hattie, and I were busy applying the wet compresses on him. “His skin drinks the cool out of him so quick,” Hattie stated worriedly. “If we don’t get this fever down, it’ll burn him out before his body gets organized enough to fight back.” The doctor’s news didn’t sound to promising. That hopeless feeling crept back in. I was worried that my boy would die. I was frustrated. Here I was faced with the biggest crises of my life and there wasn’t a thing I could do to stop it! My boy was in there suffering needlessly. He wasn’t getting better. I banged my hand on the lamp stand in frustration. Suddenly, Mark started yelling again. "Pa, the box canyon!” I just couldn’t take anymore! He had to get better! He just had to. It was time for me to use my authoritative voice and order him to get better. It’s all I had left. So as I walked in there, I grew angry and desperate. I went to the bed, but my voice was broken. "Now you listen to me, Mark. It's your father speaking. You have to quit this. You can't keep on this way, you hear me?” My voice was broken. I needed him…I needed him so bad! He was my world. Suddenly, I begged and pleaded with my boy. “Please don't die son! Please don't die!" I couldn’t take it anymore – it was too much. I laid my head down onto his sick body and sobbed, begging God to spare my boy’s life. I couldn't bear the thought of loosing him. Suddenly, Mark was dreaming again. The woman in white was calling his name. I turned and watched her. She had walked all around the pond. Marigolds were everywhere. “How come you knew my name?” Mark asked. “Why shouldn’t I?” the woman answered. She bent down and touched his face. “He still wears it?” the woman asked suddenly. “How dear and gentle of him,” the woman stated. I was standing in the bedroom just watching Mark. “It’s so hot! Please, it’s so hot!” he moaned. I slowly walked over to the bed and bent down toward him. I was worried and so spent. I just watched him suffer, wishing I could do more. I waited for that ice for a long time. I hurried in when I saw the riders coming back with it. Pedro and Micah brought in the big basket of ice. “Thanks, Micah!” I said as I picked it up. But as I took the lid off, I stared in horror. “Melts awful fast,” Micah apologized. “Riders are bringing more in a couple hours.” It was slush. The doc ordered me to bring it in and we’d use what we had. I began dumping the slush on the bed while the doctor and Hattie spread it over Mark. Suddenly, the doctor announced that the decision to live or die laid in Mark. I knew Mark had been moping for his mother the last few weeks and suddenly worried that he wouldn’t want to come back to me. Mark was having the last part of his dream. He was playing in the water and declared that the brook was cold. He commented that he’d never seen such a beautiful place before. “Ma’am, I’m awful glad that I came down here and met you,” he stated. He stared at her, completely mesmerized! But suddenly the spell was broken as Dr. Hennekin called his name. Mark looked back towards the ravine – the ravine that would bring him back to me. “I want to stay down here with you,” Mark cried. Mark suddenly began crying. “Yes, ma!” He threw his arms around her and cried. He had to live…for me. I was tired…so very tired, but I couldn’t leave my son’s side. I sat in the chair at his bedside watching him struggle with his choice to live or die. I felt his body. "Ice, he needs more ice,” I begged tiredly. Suddenly, I stood from the chair and stared at my son. He was pouring in sweat. “Hennekin, bring something to wipe off this sweat. He's melting like a wax doll." I cried. Suddenly, Hennekin came rushing in. "Sweat, blessed sweat. It dropith as the gentle rain from heaven," he said. I stared at him, not quite understanding what he meant. Suddenly, he pointed to Mark. I sat down as I watched his face. He was almost smiling – finally at peace. He was no longer in pain or struggling with some unspoken decision. I was suddenly happy…so very happy! My boy was going to live! Hattie suddenly looked at the door and started to ask if Mark would live. “He’ll do,” Dr. Hennekin answered. He wrote something on a piece of paper and threw it down on the table. “Just keep the young jack of apes on this diet until round about Thanksgiving Day!” He started toward the door. “Next time they ask you, tell them you’re a nurse!” he declared. Hattie cried tears of joy as she walked to the door and waved her thanks to the doctor. I didn’t leave my boy’s bedside – I wanted to be there when he opened his eyes so he would know just how much I loved him. When he woke up, I was sitting beside him on his bed brushing his hair back and staring down at him. He slowly opened his eyes and looked at me as he smiled a weak smile. “Well, hello Pa,” he greeted me. I gave him a smile. “Hello,” I answered simply. “I guess I've been a lot of trouble to you, huh?" "No son, no trouble,” I assured him. Suddenly, Mark touched my prickly face. "Loose your razor?" "Well son, you see-“ I started, but I suddenly couldn’t talk anymore. I was filled with joy that my son was gonna be alright! I suddenly began crying again, but this time tears of joy. I lifted my boy from the bed into my arms and hugged him tight. I silently thanked God for giving me my son. No words could express the joy I had in my heart at that very moment. I was surely happy to be a father! Piddlin' stuff.....I remember reading somewhere that Johnny Crawford was really sick when he did this part. They had to shut down production until he got better. Marian Seldes played Margaret McCain/The Vision/Hazel. Karl Swenson appeared in two episodes ― The Jailbird as Chris Manse, the stepfather of Eli. Karl — The Vision as Nils Svensen the Blacksmith. How many actors played Nils or was it Niles or Nels? Was it Swenson or was it Svensen? Natividad Vacio as Pedro, he's the one that Lucas threaten if he didn't bring the doctor to take care of Mark. John Abbott as Dr. Hennekin. Jeanne Wood played Mrs. Nils Svensen. Yes, believe it or not, Nils had a Misses. Hope Summers appeared in sixteen episodes as Hattie Denton, owner of The General Store. 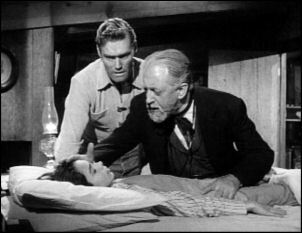 Hattie was first introduced to The Rifleman in Eight Hours to Die. Chuck Hicks as one of the cowboys listening to Hazel singing. James Dime as Andrew, the man / cowboy who sold Lucas the seed bull. Art Felix appeared twice in The Rifleman ― Smoke Screen (1960) as a Townsman and The Vision (1960) as a Cowhand. I wish to thank Nancy from the Yahoo Rifleman group for this piddlin' info on the two songs sang in this episode. Thanks Nancy! ♫ One, Careless Love, which was written for this episode. The main song in the episode is a poem set to music by Herschel Burke Gilbert & Lyrics by Alfred Perry. The song was based on a poem by Charles Kingsley, the same man who wrote Water Babies. Over river and mead and town. *Please be patient while this song loads, it may take a few seconds to load but is well worth the wait! Please note..... when clicking on the link to this sound wav - it will download to your computer.